Jobu reviews Uruguay’s big win against Perú in this weekend’s World Cup 2014 qualifying games. I must be honest with my readers here. I kind of dropped the ball on a pretty significant series of events that I could have been covering, but haven’t, and that is the World Cup qualifying matches of the past year or so. All wrongs can be righted though, so here’s to you. On Sunday, Uruguay, who was recently ranked #2 in the world by FIFA (had to throw that in for all of my Argentino readers) played Perú in a qualifying match. Just 24 hours after Argentina had taken it to Brazil (thanks to Lionel Messi’s three goals), I was hoping Uruguay would put on a show. It wasn’t as pretty, but every win is huge during qualifyings, so we’ll take it. 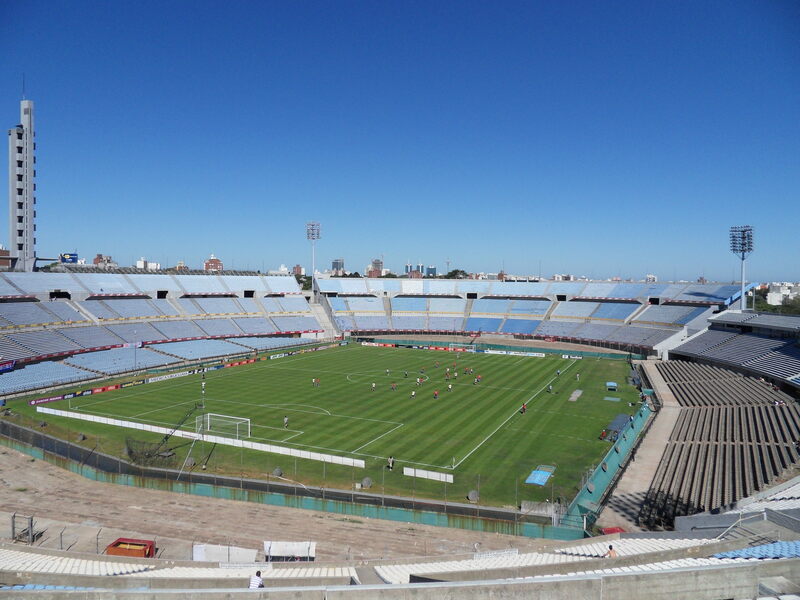 This was Uruguay’s second game in less than a week (games are played in spurts a couple of months apart), and they was coming off of a tie with Venezuela at home (in El Estadio Centenario), which gave them a point in the standings, but still wasn’t ideal, because you kinda have to win home games. Anyway, you know they wanted a big win in front of the home fans in this one. Last Saturday, Uruguay did not play well against Venezuela. That game was boring, and full of long volleys instead of actual fútbol plays, and that was not fun to watch. Things would be different against Perú. Los Charrúas, as Uruguay is known (also La Celeste), came out strong in this one. The ball was mostly handled on the ground, as opposed to in the air like against Venezuela, and the benefits were reaped in the fifteenth minute of the game when Diego Forlán sent a corner kick to the top of the penalty area, where it was headed in on one hop by Sebastián Coates. It appeared for a while that the great Luis Suárez had gotten a head on it at the goal line, but it was Coates. The ball almost didn’t go in. It ricochetted off of the goalie and rolled slowly toward the goal line. González of Peru tried to kick it out before it crossed, but replays showed that the ball barely went in the net for the first goal. It wasn’t a forceful goal, but we’ll take it. In the 30th minute Uruguay struck again. This time, Maxi Pereira (El Mono), got a rebound off of a deflected kick by Suárez from the top of the box (a terrible play by the goalie and the defense) and knocked it into the net for the 2-0 lead. It stayed that way for another ten minutes before bad luck struck Uruguay. In the 40th minute, Uruguayan defender Diego Godín got a center pass and put in one of the nastiest headers I have ever seen in a game, period. He was to the right of the goalie, and he put it into the left corner of the goal. It was beautiful. Unfortunately, He was at the wrong net, and the own goal made the score 2-1 Uruguay. Honestly, I don’t know what Godín was thinking. I mean obviously he was trying to get the ball out, and if he hadn’t headed it in, Paolo Guerrero of Perú probably would have, but it was still foolishness. It was the second week in a row that Godín had a ball go off him and into the net, which is even more ridiculous. The teams went into half time with that 2-1 score in tact, but it wouldn’t be for long once the whistle blew for the start of the second half. Just three minutes in, a total defensive breakdown (and a bad play by Godín) left Guerrerro (or “Prince” as we called him game… just look at him! spitting image) alone in front of the net, and he popped one past Uruguayan keeper Fernando Muslera (my girlfriend’s second favorite Uruguayan) for the equalizer. We certainly never expected that to happen. A bit later, Uruguay was given a chance to take the lead, when Jesús Alvarez of Perú took down Edinson Cavani in the box for a penalty kick. It was a pretty egregious play, as Cavani made a sick move to get past Alvarez and the Peruvian defender stuck his leg into Cavani’s knee to trip him up before he could be alone with the goalie. With Forlán, World Cup 2010’s best player, set to kick the penalty, things looked pretty good for Los Charrúas. Unfortunately, they didn’t convert. Forlán did not kick his best kick, but it was a great play by Peruvian goalie Diego Penny that kept the ball from going in the net. The game continued in a tie. This is when Uruguayan coach Óscar “El Maestro” Tabárez really showed why he is one of the most respected coaches in all of fútbol. He did what he failed to do in the game against Venezuela, by taking out an ineffective player early on in the second half to give his team a lift. This time, it was Forlán he pulled out of the game. He also took out Álvaro “Palito” Pereira, choosing to put in two mid-fielders, Cristian “El Cebolla (the onion)” Rodríguez and Gastón Ramirez in the 60th minute. The former made an immediate impact when, just three minutes later, he knocked another rebound from Penny back into the net for the lead. It was too bad for Penny, who, on that play, had an incredible save on a great header from Coates (on a pretty nasty free kick cross from Suárez). Unfortunately for Perú, Penny’s save bounced right back to Rodríguez for the tip in (also pretty unfortunate for Coates, who probably should have had his second goal of the game on the play). The score gave Uruguay the 3-2 lead, and now it was time to hold off Perú for another 27 minutes. In the 90th minute (with five stoppage minutes added to play), “El Maestro” made another interesting move, taking out world beater Luis Suárez (that’s not the interesting part) and putting in yet another mid-fielder, Sebastián Eguren. We were curious as to why he hadn’t gone with another defender, but were glad with the change when Eguren knocked in a goal in the 93rd minute to seal the game. Cavani, Rodríguez and Eguren came in on a three-on-two fast break (sorry for all these basketball terms), but muffed the play when Rodríguez’s center was knocked back out of the box by the defense. The ball went back out to Eguren, who gave it to Ramirez, who centered it to Cavani and Eguren, who were now alone in front of the goalie. Cavani left it for Eguren to finish, and the game was over. In all, there were some things to be concerned about when it comes to Uruguay’s play. The defensive breakdowns need to stop. There’s no way around that. Uruguay played some of the best defense last July, when they won the Copa America, but it hasn’t been quite as effective in the last couple of qualifying games. The own goals certainly need to stop, that’s for sure. This is a team that has been playing some great fútbol over the last two years (starting with the World Cup, in which they finished fourth). Right now, they are the only undefeated team from the CONMEBOL conference in the World Cup qualifying period so far (although they are second in the standings to Chile, who has a game in hand) and they lead the table in goals scored with fourteen. So far so good for the tiny South American country, eh?